A wonderful monkey mom wrote this for Mother's Day to remind all monkey moms again, why we do what we do. Monkey moms do their thing every day no matter what, so I thought this sentiment was just too special not to share. So Happy Monkey Mother's Day one and all, this one is for you, every day of the year. This is for all the Monkeymoms who have sat up all night with a sick monkey in their arms counting the hours for the vet to open and praying that there is nothing seriously wrong with their precious baby. Who have sat with a monkey and kissed their booboo and comforted them with kisses. This is for all the Monkeymoms who know the best way to get mashed bananas out of her hair. And who have gone to work or shopping or anywhere out in public with monkey poop strategically deposited where they wouldn't notice it. And who laughed instead of getting angry when someone pointed it out.... or when they got undressed that night and realized that they had walked around all day with monkey poop on their back. This is for all the Monkeymoms who make special foods for picky little monkeys because they worry that the little darling will starve... And for those who don't. For those Monkeymoms who feed their babies creepy crawly worms and crickets even though they are soooo gross. This is for all the Monkeymoms who have given loving, caring and secure homes to monkeys who were in need of a safe home because their former family couldn't or wouldn't keep them any longer. Who made a commitment to that monkey to be there no matter what. And this is also for the Monkeymom who maybe, because of circumstances beyond her control can no longer keep her baby. And because of her overwhelming love for her little one, seeks out a safe secure and loving home for her baby. That special Monkeymom has done the very best for her baby despite her own sorrow. That is true love. This is for all the Monkeymoms who understand that a monkey is a monkey and will never behave like a human. Who accepts a monkey for the wonderful creature it is even when it misbehaves. Because she knows that a monkey WILL misbehave and she is willing to deal with it... and understand. This is for all the Monkeymoms who monkey-proof their homes. Who anchor down lamps and put extra locks on doors and put away any unnecessary knick-knacks. Her home may not be as fashionable as others. But she feels that it's a small price to pay to keep her little ones safe. This is for the monkey mom who has a sign on her fridge that says "Welcome to my world. Remember you are just visiting... the monkeys live here " and who wouldn't hesitate to point it out to her mother-in-law. This is for all the Monkeymoms who have grown kids who don't understand why their mom allows a monkey to destroy her home when they had to wipe their feet and put away their toys and pick up their clothes and were never ever allowed to pee on the furniture... imagine that?! This is for all the Monkeymoms who have taken the time to educate people on what it takes to care for a monkey and that a monkey is not a pet when someone says, "How cute, I want a monkey". Who knows and points out that it takes a special kind of commitment, a lifelong dedication to care for a monkey. This is for the Monkeymoms who shop the hardware stores and pet shops looking for enrichment items to make her monkid's life happy and safe. And for all the Monkeydads who put all those projects together for the enjoyment of their monkids. This is for the Monkeymoms who love to watch endlessly as their monkeys gleefully swing and jump and play in a room that was made especially for them... probably at considerable expense. But nothing is too good for her babies. And this is for the monkeymom who had to explain that expense to an annoyed husband. But it was so worth it because those babies are so happy. This is for the Monkeymom whose little Houdini discovered an escape route and who frantically formed a search party to help find her little fugitive while desperately praying for his safe return home. This is for the Monkeymom who organizes a monkey picnic or monkey party or SSA meeting or convention. Who knows that the endless hours of preparation is so worth it when everyone gets together to share their monkey stories and experiences and proudly show off photos of their little darlings. This is for the Monkeymoms who have sat up all night either in person, on the phone or online, with another Monkeymom who has a sick monkid. Only another Monkeymom understands how frightful that can be and how endless that night can seem. This is for the Monkeymom who has gotten through that horrible night. For those who's baby has gotten well and especially for those who's babies didn't make it through that torturous night. For those Monkeymoms who can hold their babies in their arms and smother them with kisses and smell their fur and savor every precious moment. But especially... especially for those Monkeymoms who only have a photo or special toy to hold in their arms and remember all those wonderfully precious moments when their babies were in their arms and for a brief moment they can feel them and smell them and ache to kiss them. For all those special monkeymoms there is a monkey angel sitting right on her shoulder. And if she is very still and quiet sometimes she can feel that little hug or tug at her hair or smell that phantom familiar smell that lets her know that her baby is right there with her. The emotions of motherhood are universal. 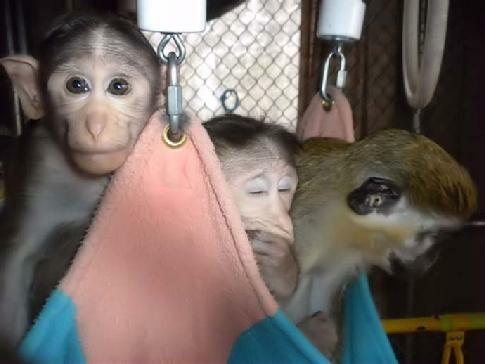 But the emotions of monkeymotherhood transcend every maternal emotion there could ever be. They are emotions of unconditional love for a unique and magnificent creature. A baby that may not even be of our own species and will never learn social graces... who wasn't born in our womb, but is definitely and undeniably a major part of our hearts. These emotions are what what give us the patience, understanding, compassion and deep love that we all have for our monkids. A VERY HAPPY MONKEYMOM'S DAY!! !